It has been amazing to watch Rico grow into the mature and experienced retriever he has become. From the beginning, the odds were stacked in his favor with his pedigree loaded with field trial and hunt test successes but even more importantly, hunters and retrievers. In most homes, as labradors weave themselves into our lives, it is not enough that they only be great retrievers. They need to be so much more. Starting as a pup, Rico became a member of the family. With our family, Rico has logged thousands of miles curled up on the floor of our car on our way to some new adventure. Some of the adventures have been fun and others have been work, but there has never been a shortage of variety. He has accompanied us to construction sites and has lifted the spirits of the elderly during nursing home visits. He has flown up rivers in jet boats, crossed reservoirs in canoes, drifted small rivers for ducks in layout boats, and lounged in ponds on a kayak. He has even watched over our family and pack goats during backcountry excursions. Calling him adaptable and versatile would be an understatement, and these are critical attributes of quality labs. 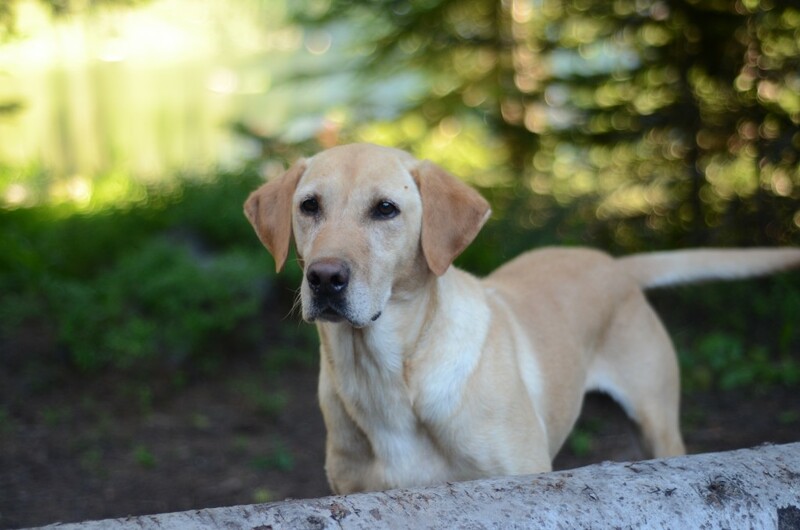 As important as those virtues are for labs, in our world, at their core, they must be hunters and retrievers. They have to want to perform those duties more than anything else. They must have tremendous desire, intelligence, instincts, and athleticism to perform at the level we demand. That is exactly what sets Rico apart. Rico finds and brings back birds under varied and difficult conditions. That is his job and he does it well with energy to spare. 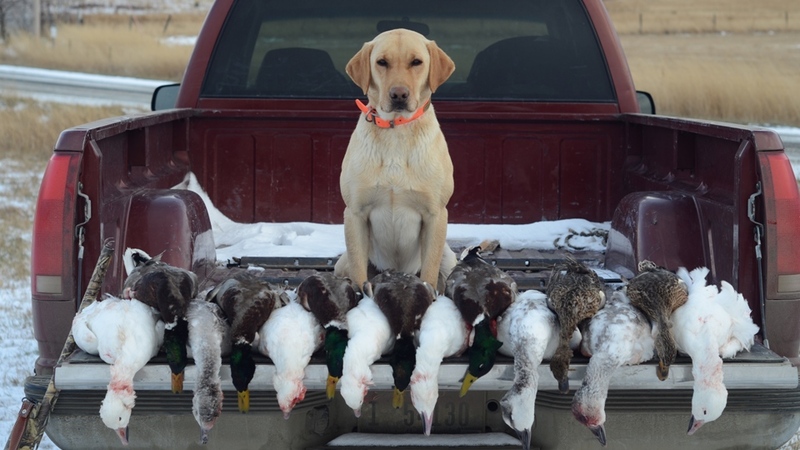 Rico has retrieved hundreds of migratory and upland birds and still has many years ahead of him. Over the years it has been a joy to watch him collect multiple downed birds, perform blind retrieves, and 100+ yard retrieves. Rico has been a pleasure to have as a hunting companion. He doesn’t wine or whimper in the duck blind as his boredom or anticipation builds. He waits alert and attentive for those birds that try to catch us off guard. 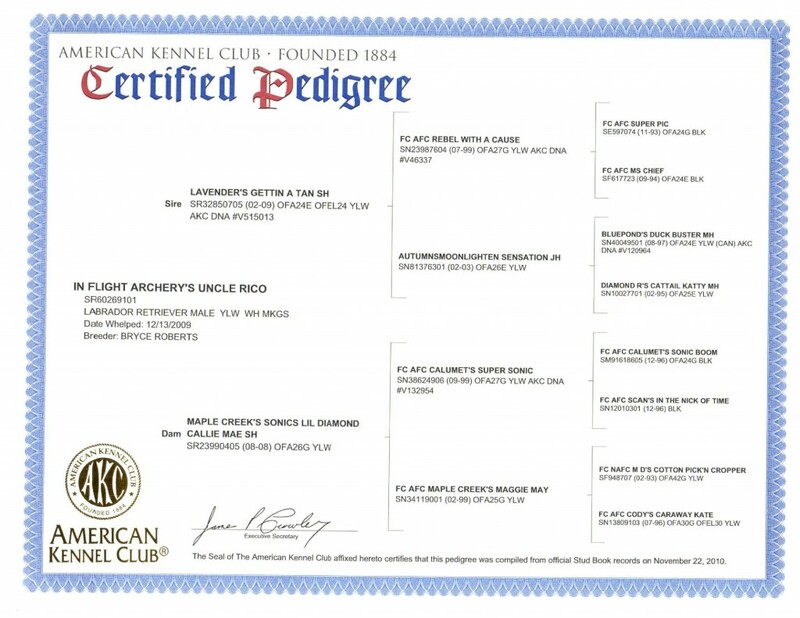 If you are ready for a companion that is hunting bred to its core and can still function as a wonderful member of the family in the off season, check up on Rico’s litters.